Make your website work harder and deliver better results, higher traffic and more conversions. Your website may look good, but does it deliver? Search Engine Optimisation (SEO) can seem like a dark art, but it really is critical for your online presence. 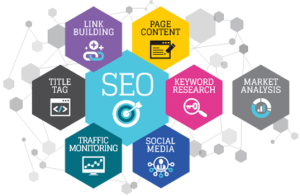 Effective SEO ensures your website ranks high in search engine results and accurately reflects your business to attract the right customers. Ranking highly on Search Engine Results Pages (SERPs) for searches relevant to your business is absolutely critical for generating new business. You can spend money on PPC advertising to compensate for poor organic presence, but we recommend you improve your SEO, boosting your organic presence and saving your advertising budget for smart, strategic campaigns. At FireTap, we can analyse the current state of your website, identify its strengths and weaknesses, and optimise it to improve your organic presence. Search engines like Google and Bing use hundreds of ranking factors to assess the quality of your website, determining its ranking. We can review your website and tell you exactly what you need to do to get more traffic from search engines. From metadata, tagging and keyword-optimised content to maintaining your offsite SEO, our expert team will get your website ranking up and help keep it there.